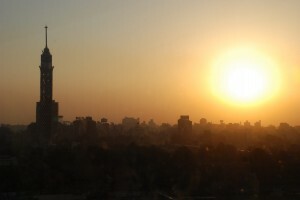 Where we left off, June 30, Evan and I had a bit of a rough day in Cairo. It took us a long time to hail a taxi into the city from near our hotel, which was in the suburb of Mohandisseen, and about 10 minutes into our ride our cab was rear-ended. Being hit from behind, while we were stopped, forced us into the car in front of us, and then we were hit again from behind, most likely because the car that hit us first got hit again. It was quite a shock, but nobody got hurt, thankfully. It did, however, put a damper on our day. The cab driver did manage to get us to our stop — a metro station only about 2 blocks away from where we were hit — and without much time to recuperate, we headed underground to figure out Cairo’s metro system. There are only two lines, so it was pretty easy, but everyone pushes to buy tickets and get on the train, though nobody seems to rush up and down the escalators like they do in London. We finally arrived at the Coptic quarter where we relaxed for a bit, then visited the beautiful Coptic Museum, which was housed in an impressive building with ornate carved-wood ceilings and had a nice collection of stone carvings, textiles and books. We wandered around the walled in Coptic quarter for a bit after we were done with the museum, but weren’t able to see much since it was after 4 — closing time for most of the attractions there. To unwind from our stressful day, we went up to the rooftop bar at the Nile Hilton to grab a drink and watch the sunset over the Nile, then had a nice dinner at a great Lebanese restaurant, Sabaya, in the Intercontinental. 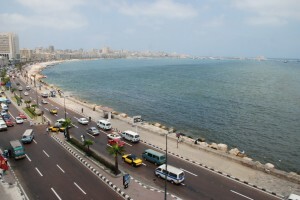 We were feeling a litle overwhelmed in Cairo with all the noise and traffic, so we decided to head to Alexandria July 1. We took the train, which was nice and quick and air conditioned. While we were waiting on the platform, though, we saw something new — trains would come in on further platforms, and tons of passengers would be in such a hurry to get out that they would exit the wrong side, jumping down onto the tracks to scramble over to and climb up on another platform. In Alexandria, we were happy to be able to walk to the center of town from the train station and found a nice little budget hotel right on the sea. We were 5 floors up and had a balcony with a great view of the coast and an accompanying sea breeze. After getting some lunch at a rather touristy pizza shop, we walked west down the coast to Fort Qaitbey, which sits on the site of the old pharos/lighthouse of Alexandria, and was apparently made with some pieces of its ruins. The fort was picturesque and well-preserved, with great views of the city. It looked like a stylized fairy-tale castle and had lots of corridors, walks and rooms open to explore. We stayed at the fort until closing time, then walked back down the corniche to our hotel where we watched the sunset from our balcony. 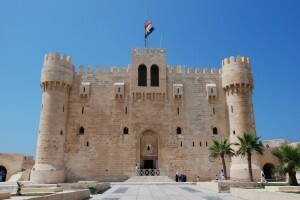 The next day, July 2, we visited the catacombs, Pompey’s Pillar and the Biblioteca Alexandria. At the catacombs, we descended a spiral staircase surrounding a central pit – where bodies were lowered down — and then got to explore the underground world that was started as a family tomb in the 2nd century A.D. There was a room for the family to dine to mourn/celebrate their dead relatives, and there were plenty of crpyts to wander past in the maze of chambers. There were also some carvings and murals of Egyptian, Greek and Roman funerary practices and myths, like Isis and Osiris, and Hades and Persephone. After our time underground — where we were the only tourists — we headed back up to the sunlight and down the street to see Pompey’s Pillar, the only roman remain left standing and intact in all of Alexandria. The pillar was monumental, but everything around it was in ruins. There was an underground library to explore, which was neat, and there were also some sphinxes brought in from Heliopolis. There was also supposedly a Nilleometer, and though we saw the sign for it, we couldn’t discern anything in the vicinity that could be used to measure the depth of the Nile. We walked back to town and headed to the east end of the coast and to the library — Biblioteca Alexandria — the iconic disc-shaped building meant to be the modern verson of ancient Alexandria’s famed library, which was completely destroyed. As striking as the building is from the outside, looking like a UFO, the inside proves even grander, with a massive, open floor plan with tiered levels, plenty of computers and many different museum exhibits. 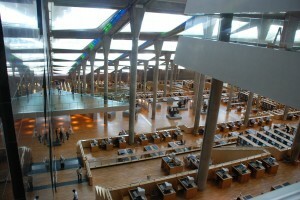 We stayed until 7 p.m., closing time, enjoying the quiet, the air conditioning and the beautiful modern surroundings. Today, July 3, we headed down the corniche once again, this time to seek out a juice bar which our guidebook said has the best mango juice. Ever. Well, I’m no mango juice connoisseur, but the pulpy juice was deliciously sweet and fresh and made a great breakfast. The juice bar was also quite a spectacle, entirely decorated with fruits, outside and in. It smelled fantastic. We didn’t do much else in Alexandria save for heading to the train station to make our way back to Cairo. We found a nice little hotel downtown called the Hotel Osiris, and we took a sunset felucca ride on the Nile before a nice, relaxing dinner — a great way to spend our last night in town. Tomorrow we’re off to Jordan to have more adventures… and hopefully we’ll be able to post some photos, too.